yaM Labs (where yaM stands for Yet Another Meeting) is a Russian Start-Up founded by Anatoly Gaverdovky. 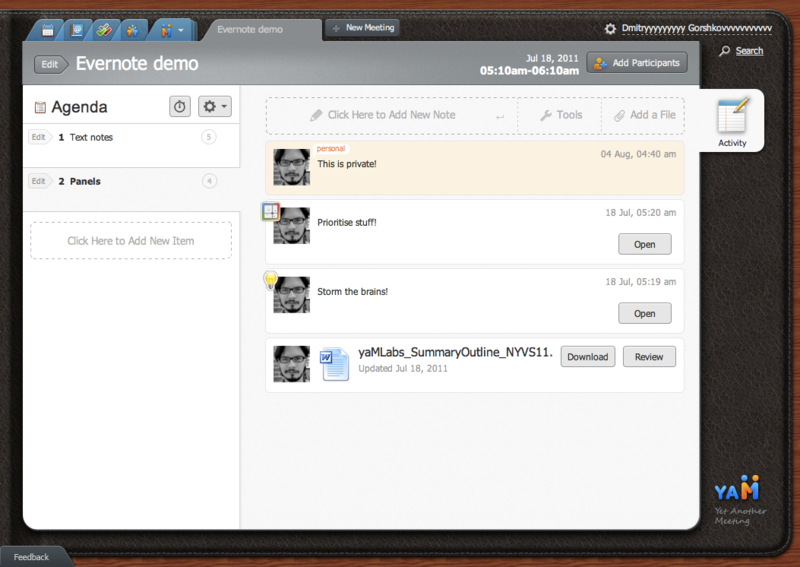 The company creates Cloud-based software that enhances the efficiency of meetings. GoalEurope’s Natasha Starkell has talked with Anatoly Gaverdosky about his business past, his new company and future plans. Eight software engineers and their CEO, Anatoly Gaverdovsky, created Cloud-based application to make meetings more efficient. The yaM team members are based in Moscow, St Petersburg, Minsk and even in the little known town of Kamishin. There is no doubt that this virtual team makes good use of its software even as it develops it. “I have always wanted to develop products. I did not go into the service industry ‘voluntarily’, but to survive,” Anatoly Gaverdosky begins his story. It took him over a decade to be able to do just that. Many years and many meetings ago, in 1993, Gaverdosky co-founded Vest Co. – a Moscow-based software company which developed a few products in the document management and workflow space. Vest sold its OEM license to PC Docs, then the world leader in document management software. In 1997, he began managing a spin-off, which became Vested Development Inc., based in Boston, Massachusetts, USA, with its development center in Moscow, Russia. The new company offered outsourcing services in the field of software development, initially for the American market and, from 2001 onwards, for the Russian one. More meetings followed between 2001 and 2006 and some of these turned out to be productive. During this time, Gaverdosky grew his company to employ over 400 people; expanding to Erevan, Armenia; Kiev, Ukraine and the Russian towns of Tver, Ryazan, Kazan and Saratov. When VDI had ‘spare’ IT resources, Gaverdovsky would use them to experiment with new products. But those attempts bore no fruit. “The services and product divisions were in competition for the same resources within the company, and could not co-exist. As a result, the product division had no success,” he admits. Then, in 2006, something changed. Having learned from past mistakes, Gaverdovsky entered into a collaboration with then outsourcing partners Afortio and co-founded InvisibleCRM, now one of the most successful Ukrainian technology companies (read more about InvisibleCRM here). In 2006, he sold VDI to Epam, where he held the position of senior vice-president until 2009. Once his contractual obligations to Epam had been fulfilled, Gaverdovsky continued pursuing what had been his passion for many years: inventing new products. His breakthrough idea was born of his day-to-day work experience, of the frequent occasions when his time had been wasted in inefficient meetings. In 2009, he founded yaM Labs. What is unique about yaM Labs? yaM Labs is a Cloud-based real-time collaborative application which allows its users to effortlessly prepare, run and follow up on meetings to get the most out of the interaction. Its main unique feature is the ability to organize and share information before (meeting agenda, participants, tasks), during (pro-cons analysis, documents sharing, whiteboard) and after the meeting (to do lists, decision protocols). Gaverdovsky explains: “When you just use your notepad to record what is being agreed or, worse, rely on memory, you either forget half of it or have no time to organize your notes, because you have to rush to the next meeting. yaM allows you to take notes and prepare for the follow up simultaneously.” yaM also features Google account integration, including Google Docs and Google Calendar. In March 2011, yaM Labs raised 500,000 US dollars of venture capital from Russian venture fund Foresight Ventures. This investment money is being spent on Beta testing and, more importantly, on evaluating the effectiveness of various marketing channels, such as social media, Google Ads and others. yaM Labs has become a featured partner of Jive Network. The business model allows users a fixed number of meetings for free, but charges for higher volumes and advanced features. At present, the company receives 1,000 registrations per week. By October 2011, Gaverdovsky expects to have all the answers regarding the best marketing channel, and will begin the next fundraising round to fuel the company’s expansion. On the question of where the company plans to raise its next funds, Gaverdovsky is adamant that he will be looking for a Western investor, capable of contributing to yaM Labs’ global growth ambitions.